Now, turn off the TV and encourage your little ones to explore nature this fall. It’s often tempting to stay at home when it’s a little bit cold outside. But with so many amazing things to do during the fall season, it’s hard to find an excuse to not enjoy different fall activities outdoors. I think it’s important to teach your children to love every season of the year. If you can’t stop moaning about the cold weather and how bad the fall season is, chances are your kids won’t love it too. Learn to enjoy the fall foliage, weather and activities, and teach your kids to do the same. They will definitely thank you down the road. My children love exploring nature in the fall and they always enjoy the beauty of Mother Earth and the freshness of the air. Read on to find out a few fun ways to explore nature with your kids during the fall season. Fall is the season of the harvest. So go to a farm and pick your own apples, tomatoes and pumpkins. You could also go to a farm simply to stand and discuss the various fruit and vegetables that are out on display. Your children will gain more appreciation for farming as well as for healthy eating. It’s also an easy and quick way to show your little ones how many fruit and veggies nature boasts. I live in a rural area with plenty of farms and our farmers like to create amazing corn mazes during the fall season. It’s always a fun and interesting adventure to enjoy with my children. If there are some farms in your area that have corn mazes be sure to enjoy navigating them with your family. If you have older kids, you can try to get through a corn maze at night. Don’t forget your flashlights. Perhaps, the easiest way to explore nature with your kids during the fall season is take regular chilly-day strolls. When your kids come home from school, instead of sitting in front of the TV, pull on warm sweaters and go for a stroll. Talk to each other, point out the changes of the season and simply appreciate being outside. You can also take some bag and collect acorns, beautiful fallen leaves, and other nature items. The crisp air will tire your children out and give them a good night’s sleep. Do you remember jumping in the piles of leaves when you were a child? Why not do the same thing with your children? 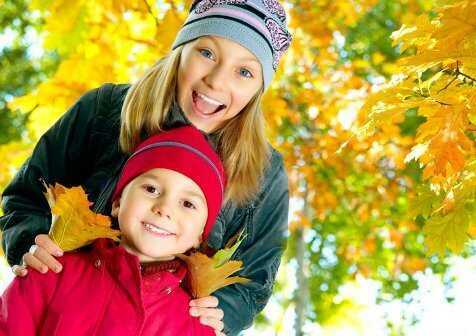 Have your kids help you to rake up a pile of leaves and let them jump on in. Then have them help you bag up the piles. This will teach your children how to help out with the yard work while having fun. Although the summer season is over, you can still have family picnics during the fall season. Pack up a lunch and go to your local park to eat alfresco with your children and enjoy walking and playing in the fall sun. If you live near a forest, it’s even better than a park. There are so many things to explore with your kids in a forest. Your little ones will certainly like this idea. Did you know that the night sky changes with the seasons? Teach your children about the different constellations and enjoy observing the fall night sky. If you have observed the sky during the summer season, ask your kids if they notice any difference between the summer night sky and fall night sky. Hot chocolate with marshmallows will warm you up and boost your moods. Investigate those small fall goodies you collected on your stroll with your kids. Use a magnifying glass to have a closer look at flowers, leaves, twigs and rocks. Make leaf rubbings or a collage out of the items. It’s a wonderful extension activity after a stroll and a fun way to explore the nature of fall. These amazing fall nature activities are wonderful ways to get your kids outside to enjoy Mother Nature and all its beauty. We live in a modern world where children spend their time at home watching TV and playing computer games, so it’s vital to teach your kids to love and appreciate nature and spend more time outdoors no matter what the season is. What are your favorite ways to explore nature with your kids during the fall? Please share your ideas with us.